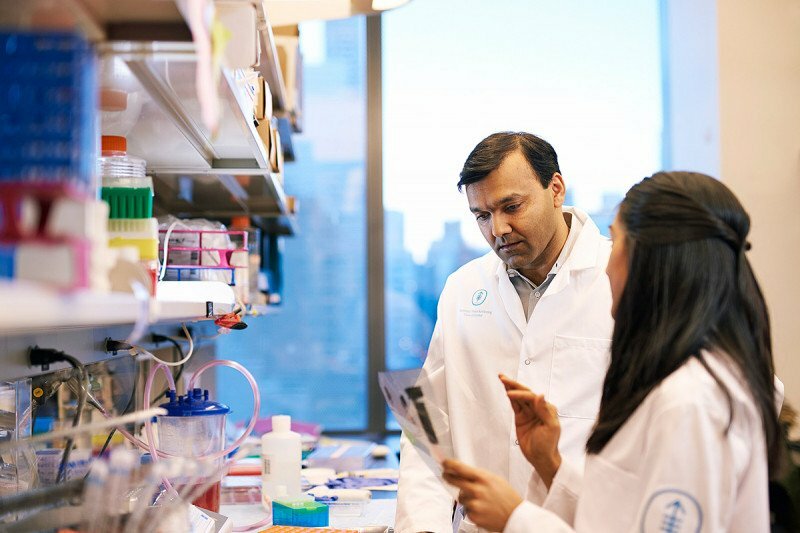 Physician-scientist Sarat Chandarlapaty and GSK student Kinisha Gala discuss the results of an experiment. The Gerstner Sloan Kettering faculty supports our students in their training from their first day of school through their thesis defense and beyond. As a new student in our program, you’ll be assigned a first-year mentor who will guide you through your initial year and help you make decisions about your training and selecting lab rotations. Watch third-year GSK student Kasia Konopacki discuss her research and training with her mentor, immunologist Alexander (Sasha) Rudensky. Watch second-year GSK student Ryan Smith and neuroscientist Viviane Tabar discuss their student-mentor relationship. Once you’ve selected your thesis lab, your thesis mentor will be your main support in conducting your research and preparing for your dissertation defense. You’ll also choose a thesis advisory committee to meet periodically with you and your mentor to discuss your goals and progress. In your second year, you’ll have the option to begin your clinical apprenticeship, intended to give you a perspective on how your research might be applied in the clinic. You’ll be paired with a clinical mentor who will help you focus on specific clinical challenges related to your research project. GSK students typically develop lasting relationships with a number of faculty members, including their thesis mentor as well as other advisors and members of their thesis and dissertation committees. You’ll also be interacting with the section leaders of the Core Course and other faculty members who teach the course. In addition, Dean Michael Overholtzer and Associate Dean Linda Burnley are committed to helping you throughout your studies. During our Deans’ Hours, students have the opportunity to informally ask questions and discuss concerns. Mentors take a true interest in training you to be a scientist. They are willing to go the extra mile.